With summer here and the Dory movie in theaters, I thought some more beach crafts for kids would be fun. That’s why this cardboard tube jellyfish came to be, isn’t he the cutest?? It’s as easy as recycling a cardboard tube and using a foam ball. 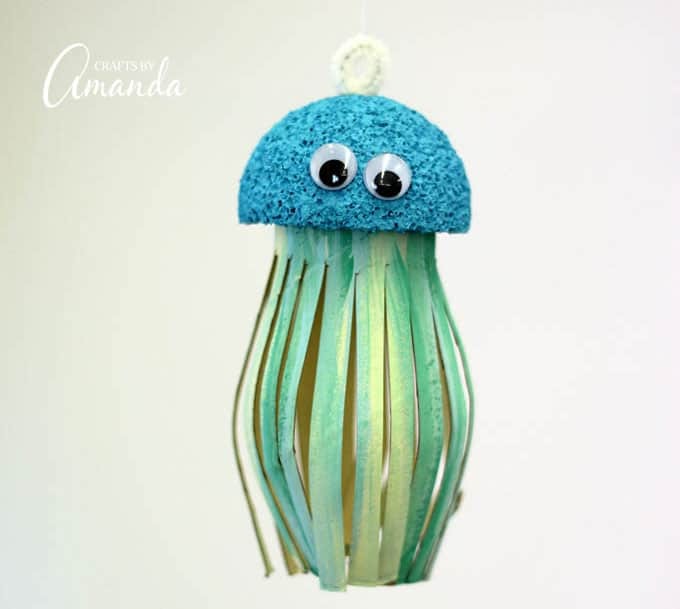 I’ve always loved the animals of the sea, and jellyfish crafts are just one of the things I’ve made when inspired by ocean life. 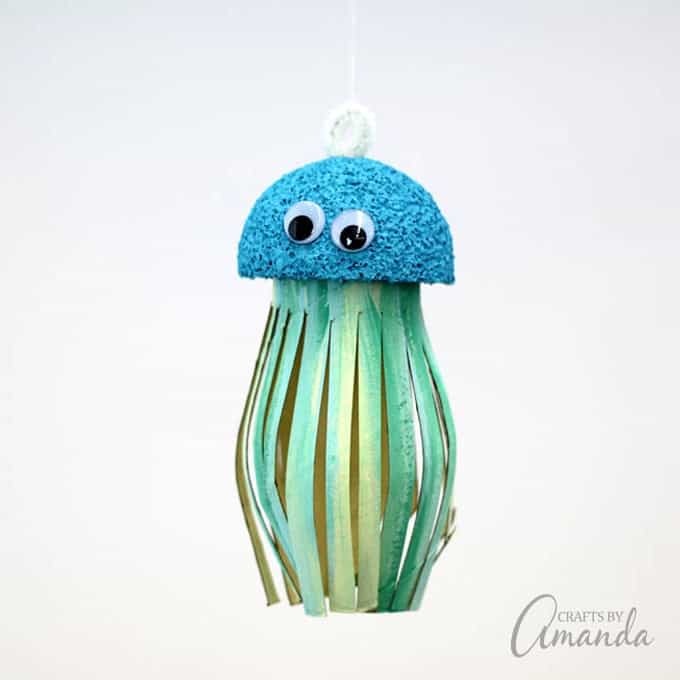 There’s something so mysterious about jellyfish, and this cardboard tube jellyfish is a fun way to discuss that with your kids while they are creating. Make it a fun lesson on sea life while they are getting creative! Start off by cutting the Styrofoam ball in half. You can save one of the halves for another project. You only need one of them for this craft. Paint one half of the ball with light blue paint and allow it to dry. Paint the inside of the cardboard tube first. You can use any color for the inside, I chose ivory. when that is dry, paint stripes on the outside of the cardboard tube using all three colors. When everything is dry, turn the foam ball upside down with the flat side facing up. Place the cardboard tube in the center of the flat side and “draw” around the tube with a craft knife. Remove the tube temporarily. Use the craft knife, or even a pencil, to widen the circle you just created. When it’s wide enough, insert the cardboard tube into it, fitting it snugly. Use scissors to cut slits up the length of the tube. Bend the tentacles of the jellyfish by pushing the ends of the tube into your palm. Cut a piece of chenille stem about 4-inches long. Bend it in half to create a loop and twist the open ends together. 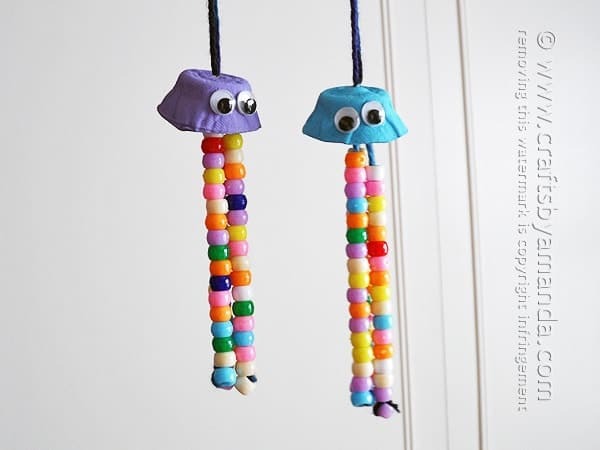 Insert those twisted ends into the top of the jellyfish’s head to make a hanger. Glue the googly eyes on the front of the half-ball. 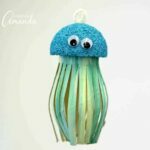 The only thing left to do is hang your adorable cardboard tube jellyfish somewhere that everyone will see it! 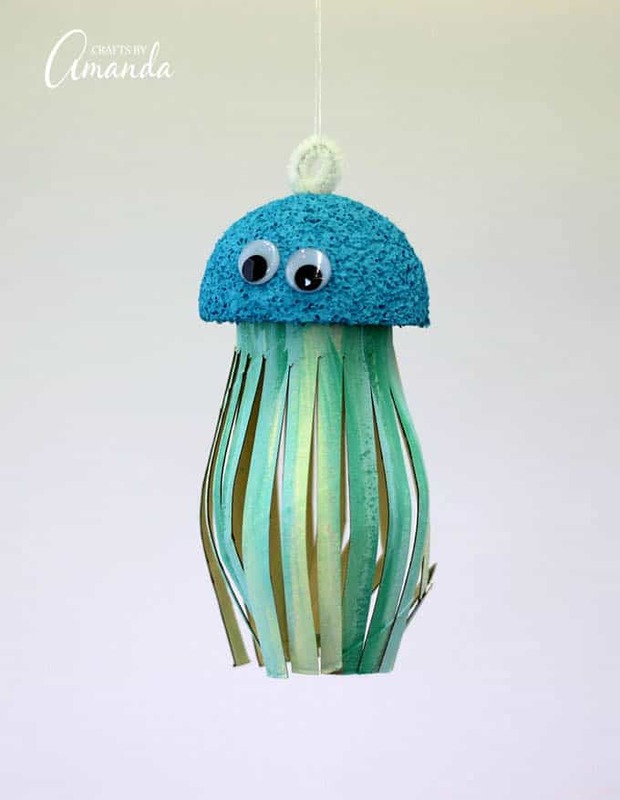 If you like recycling, these egg carton jellyfish are right up your alley and are oh so cute! Need to use the other half of that Styrofoam ball? 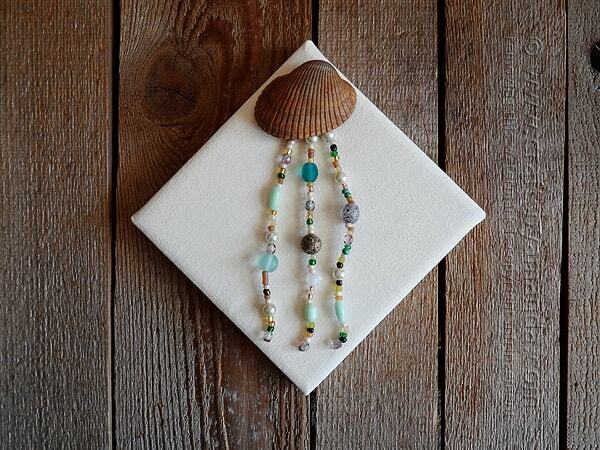 Try these rainbow jellyfish on for size! Looking for a teen project or a craft for adults? This seashell jellyfish on canvas is a great home decor project! Want even more free craft ideas? Be sure to join my newsletter for FREE and craft ideas sent to your inbox every week. When everything is dry, turn the foam ball upside down with the flat side facing up. Place the cardboard tube in the center of the flat side and "draw" around the tube with a craft knife. Remove the tube temporarily. Use the craft knife, or even a pencil, to widen the circle you just created. When it's wide enough, insert the cardboard tube into it, fitting it snugly. Use scissors to cut slits up the length of the tube. Bend the tentacles of the jellyfish by pushing the ends of the tube into your palm. Cut a piece of chenille stem about 4-inches long. Bend it in half to create a loop and twist the open ends together. 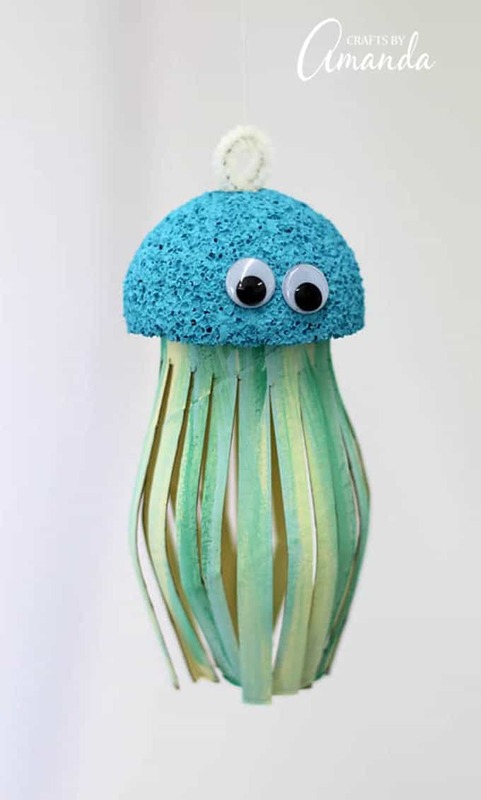 Insert those twisted ends into the top of the jellyfish's head to make a hanger. Glue the googly eyes on the front of the half-ball.